These questions reference a student's parent for FAFSA filing purposes. A parent is a biological or adoptive parent and/or a step parent in the case of a remarriage (see Question 59 for marital status guidance). Grandparents, foster parents, and legal guardians are not considered parents on this form unless you have been legally adopted by them. Parental information is required when a student answers no to all questions in the Student Status section (Questions 46-58). 2015 tax information will be necessary to complete this section. Always answer $0 if a question does not apply to you. Do not include cents. Round to the nearest dollar amount. Marital status is answered as of the day you are filling out this FAFSA form. If a parent is married, remarried or living together in the same household the household is considered a married household. As such, both parents living in the household are required to list their income and asset information for financial aid eligibility. This may include the student's biological parents, a stepparent, and adoptive parents. A prenuptial agreement or other documentation indicating that a stepparent has no financial responsibility is NOT recognized for financial aid purposes. Never Married means a single parent who has never had any marital event (i.e. divorce). Unmarried and both parents living together: In this situation both parents are required to provide information on the FAFSA even if they have not done so in the past. In the event that your legal parents are divorced or separated but living together select this status and list both income and asset information for each parent. Do not include any person who is not married to your parent and who is not a legal or biological parent. Divorced/separated parents will complete the FAFSA based upon which parent the student is living with or the location where the student lived most in the past 12 months. Only that parent will provide income and asset information. Do not include information for the parent not living in the household. If you have not lived with a parent in the last 12 months, use the information of the parent who provided the majority of your financial support the last time you lived with a parent. Widowed parents will only utilize their information for financial aid purposes. No income or asset information is considered of the parent that is deceased, even if income was reported on the current year tax return. Should a parent become divorced/separated or widowed at a point within the school year you will need to contact the financial aid office at your college to determine how best to address your change in circumstances. Indicate the date (month and year) of the marital status that applies to the parent household. In cases where parents are remarried list the date of remarriage. In cases where a parent is divorced/widowed/remarried more than one time list the date of the most recent marital occurrence. In the case of widowhood, list the date of death of the parent. This question will only be left blank in the case where a parent has never married or is unmarried but both parents are living together. For example, if they were married, divorced, separated or widowed on June 1, 1980 you would enter 061980. List the social security numbers, names, and birthdates of both parents when parents are married, remarried or living together in the same household. If the parent has no social security number, enter all 0's. List the social security number, name and birthdate of only the parent who is providing his/her financial information on the FAFSA when parents are divorced/separated, widowed or never married. The parent birthday is used to determine the amount of assets protected for financial aid purposes. For example, if the parent birthday is December 15, 1964 you would enter 12151964. If you enter your email address the Department of Education will be able to send your FAFSA results through a secure link. If you do not receive confirmation within 3-5 days, the email may have gone into your junk folder. You will need to retrieve it from there. This email will also be available to the colleges you list on the FAFSA. Indicate your state of legal residence as of the date you are filling out the FAFSA. Select "Yes" if you became a resident of your state before January 1, 2012 or "No" if you became a resident of your state on or after January 1, 2012. If you answered "No" to the question asking if you became a legal resident of your state before January 1, 2012, provide the month and year you became a legal resident of your state. For example, if the parent date of legal residency is May 1, 2015 you would enter 052015.
any student who still answers no to all the Questions in Step 3 on the FAFSA even if they do not physically reside in the parental residence. Do not include siblings who are attending US military service academies. An unborn child may also be included in the household size if the child will be born within the upcoming academic year for which the student is applying for financial aid. The household size may not necessarily be the same as the exemptions you claim on your tax return. Include as college students any student in the household enrolled in college on at least a part time basis (6 credit hours or more). Parents and high school students taking courses for college credit are NOT counted in the number in college. If a parent is working on a degree or certificate you may wish to contact the college where the student is attending to discuss the parent's attendance. Mark option "a" if you have an accurate current year tax return with all completed tax documents (i.e. W-2's, 1099's, K-1's, etc). Mark option "b" if you are estimating your current year tax return or using a previous year's tax return. If you select this option you must update your FAFSA when you have a completed current year tax return. Mark option "c" if no tax return will be filed. Married, filing separate return (both parents still need to report information even when filing separately). It is best to utilize IRS data retrieval. When parents are unmarried but living together or married and filing separately it will not be possible to use the IRS data retrieval option on the FAFSA. However, it is advisable to use the tax transfer option with regard to other filing statuses. Indicate the type of tax return that you filed for the current tax year. This information can be found in the top left hand corner of the tax return. If you electronically submitted your tax return you will need to locate your full return to determine the type of form you filed. Your adjusted gross income may or may not be the same as your wages from working. Numerous items are included in determining adjusted gross income so do not be concerned if this figure does not match your W-2 wages or self employment earnings. If your adjusted gross income is negative you should list the amount as a negative. The FAFSA looks specifically at income earned from working. This information will be found primarily in Box 1 on a W-2 form. If you are self-employed, this information may appear on Line 12 (for business) or Line 18 (for farm) or Box 14 (Code A) of IRS Schedule K-1 Form 1065 (for partnership). Add W-2 wages, business income, farm income, and/or self employment earnings from your K-1 together if one individual earns income from more than one of these sources. If the business (Schedule C), farm (Schedule F) or partnership (K-1 Form 1065 Box 14 Code A) shows a loss, treat this negative figure as a $0 when determining earnings from work. Each parent in a two parent household also needs to report their earnings separately. Do not include all earnings under one parent's income from work if both parents are working. You will only report a $0 under earnings from work for a parent 1/parent 2 if that individual earns no income in their name or if self employment earnings are negative. Amounts on Line 17 or Line 21 from a tax return are not considered earnings from work so these amounts should not be listed in these questions. You are a displaced homemaker which means that you have been providing unpaid services to your family (e.g. stay-at-home parent), you are no longer being supported by your spouse, you are unemployed or underemployed, and you are having trouble finding or upgrading employment. If you quit your job you are generally not considered to be a dislocated worker, even if you are receiving unemployment benefits. If you are not sure you meet the qualifications to be considered a dislocated worker, answer "Don't Know" to this question and contact the financial aid office at the college you are planning to attend to discuss your situation. There are other reasons where a 1040 form are required although these are the main reasons. If you are uncertain as to whether you could have filed a 1040A or 1040EZ form we advise you to contact your tax preparer. Income tax is the amount of tax that you owe based upon your taxable income. Be certain you specify only the tax lines listed. This will NOT be the amount withheld on your W-2, your self-employment tax, your adjusted gross income, your refund amount or your tax balance due. 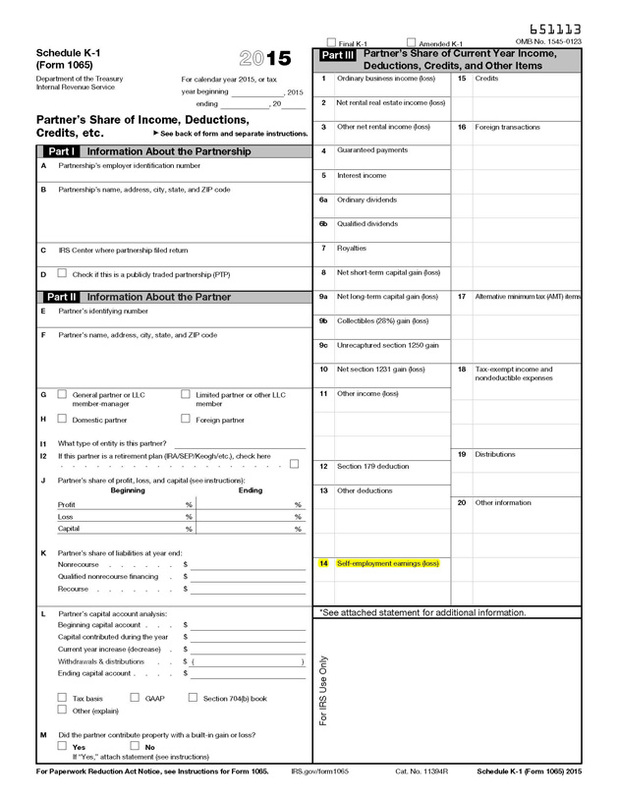 Form 1040EZ - If neither box on line 5 is checked on the 1040EZ form, enter 01 if you are single or 02 if you are married. If either the "you" or "spouse" box is checked use Worksheet F on the reverse side of the 1040EZ to determine your number of exemptions ($3950 equals one exemption). Another option for 1040EZ - If you claim a student on your tax return the student will list 0. Exemptions may not necessarily be the same as the number of people living in your household. Indicate the exemptions as they appear on the tax return. Indicate a $0 if you do not receive these items. Report total amounts for calendar year 2015. Report child support paid for all children living in another household. You will not report support for children who are living with you as reported in question 73. Report only the amounts actually paid if different than what is supposed to be paid. If you do not know your annual amounts contact your state's Health and Human Services Department. Earnings from need-based employment program such as Federal Work-Study. Not all campus based employment is Federal Work-Study. Contact the Financial Aid Office at your institution if you are unsure. Also count earnings received via employment fellowships and assistantships. Report grant and scholarship aid here ONLY if the amounts received exceeded the cost of tuition, fees, books, and supplies AND you reported this amount on your tax return. This figure will typically appear on Line 7 of the 1040 Form or 1040A Form and on Line 1 of the 1040EZ Form with a SCH notation. It may also appear on Line 21 of the 1040 Form. Americorps benefits and grants or scholarship parts of fellowships and assistantships may also be reported if the earnings are counted on the tax return. Report combat pay or special combat pay only if it was taxable and included in your adjusted gross income. Report earnings from work via a cooperative education program offered by a college. You will need to visit with the financial aid office at your college to determine the amount to be listed. If none of these sources of untaxed income apply to you, indicate a $0. Report total amounts for calendar year 2015. You must report pre-tax contributions to retirement accounts such as a 401(k). Do not report the value of the retirement plan, only the pre-tax contributions reported on your W-2. You do not need to report employer contributions, employer matching amounts, or after tax contributions. These amounts may be reported on your W-2 form in boxes 12a - 12d, codes D,E,F,G,H and S. Do not report pre-tax contributions to cafeteria plans, health flex accounts, dependent care expenses or insurance plans. An example appears below. 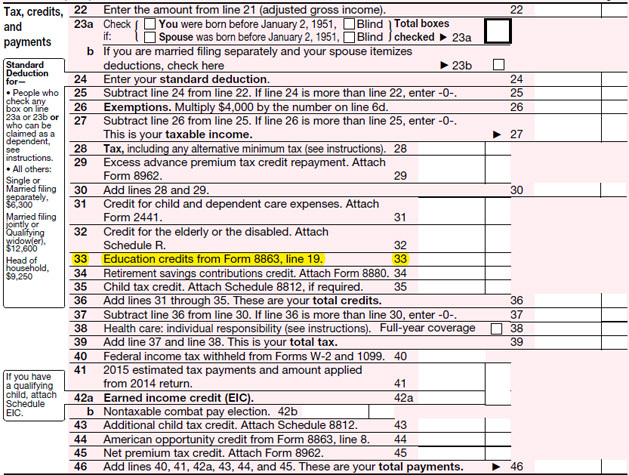 Form 1040 - Line 28 and Line 32 (If you have figures on both of these lines, add them together and report the total). Report the amount of child support received for all members of the household including children other than your student. Report only the amounts actually received, not what should have been received. Child support received by you should be reported in this question if the money is paid directly to you. If the payments are received directly by your student the amounts should be reported in student question 45. If you do not know your annual amounts contact your state Health and Human Services office. Do not include foster care or adoption payments. If the figure is negative, report $0. Report housing, food and other living allowances that are a part of an employee's compensation package. The most common situation is a member of the clergy although anyone receiving a housing benefit as a part of their compensation will include it here. These amounts may or may not be listed on your W-2 form. 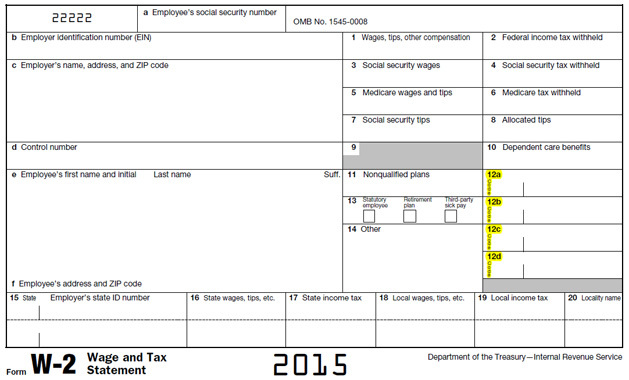 Clergy may locate a housing allowance in Box 14 of the W-2. If the amount is not reported on your W-2 refer to your employment contract or ask your employer. Do not include the value of on-base military housing or the basic military allowance for housing. Report the amount of Veterans non-education benefits received for all members of the household including children other than your student. Veterans non-education benefits received for you should be reported in this question if the money is received in your name. If the payments are received directly in the student's name the amount should be reported in student question 45. If you do not know your annual benefit amounts contact the VA's toll free number at 800-827-1000 or visit the VA Web site at www.va.gov. You will NOT count financial aid received, foster care benefits, earned income credit, additional child tax credit, welfare payments, untaxed Social Security benefits including Supplemental Security Income (SSI), Workforce Investment Act benefits, combat pay, or benefits from flexible spending arrangements (eg. cafeteria plans), foreign income exclusion or credit for federal tax on special fuels. A - Uncollected social security or RRTA tax on tips. Include this tax on Form 1040. See "Total Tax" in the Form 1040 instructions. B - Uncollected Medicare tax on tips. Include this tax on Form 1040. See "Total Tax" in the Form 1040 instructions. D - Elective deferrals to a section 401(k) cash or deferred arrangement. Also includes deferrals under a SIMPLE retirement account that is part of a section 401(k) arrangement. E - Elective deferrals under a section 403(b) salary reduction agreement. H - Elective deferrals to a section 501(c)(18)(D) tax-exempt organization plan. 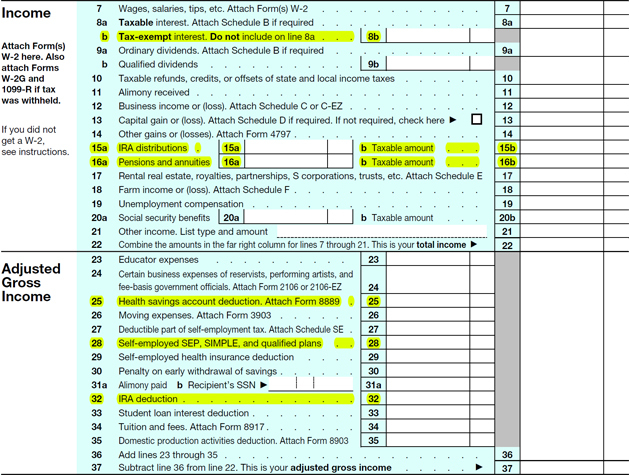 See "Adjusted Gross Income" in the Form 1040 instructions for how to deduct. K - 20% excise tax on excess golden parachute payments. 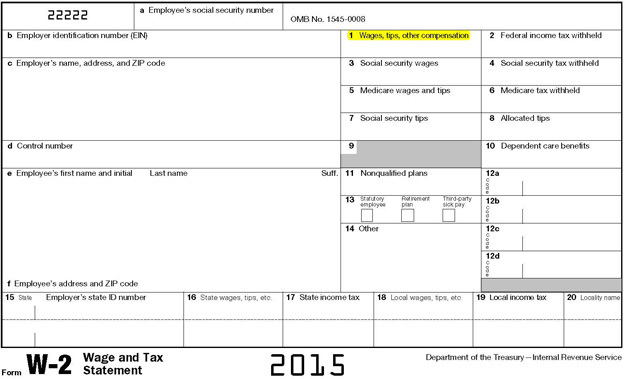 See "Total Tax" in the form 1040 instructions. M - Uncollected social security or RRTA tax on taxable cost of group-term life insurance over $50,000 (former employees only). 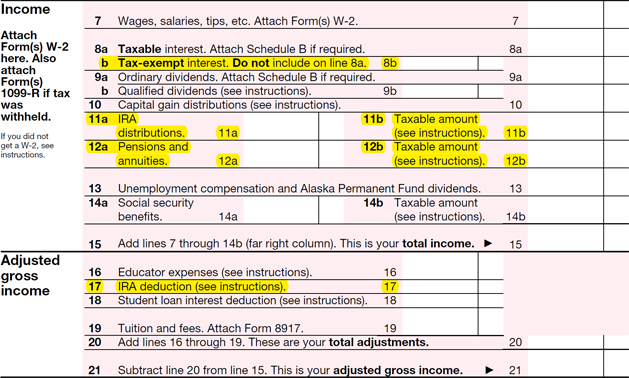 See "Total Tax" in the Form 1040 instructions. N - Uncollected Medicare tax on taxable cost of group-term life insurance over $50,000 (former employees only). 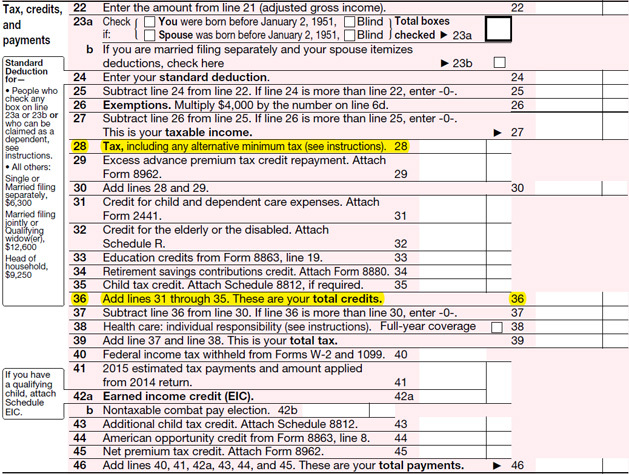 See "Total Tax" in the Form 1040 instructions. Q - Nontaxable combat pay. See the instructions for Form 1040 or Form 1040A for details on reporting this amount. R - Employer contributions to your Archer MSA. Report on Form 8853, Archer MSAs and Long-Term Care Insurance Contracts. T - Adoption benefits (not included in box 1). You must complete Form 8839, Qualified Adoption Expenses, to compute any taxable and nontaxable amounts. W - Employer contributions to your Health Savings Account. Report on Form 8889, Health Savings Accounts (HSAs). Y - Deferrals under a section 409A nonqualified deferred compensation plan. Z - Income under section 409A on a nonqualified deferred compensation plan. This amount is also included in box 1. It is subject to an additional 20% tax plus interest. See "Total Tax" in the Form 1040 instructions. AA - Designated Roth contributions to a section 401(k) plan. BB - Designated Roth contributions under a section 403(b) salary reduction agreement. This question refers only to personal checking accounts, savings accounts, and cash on hand as of the day you complete the form. Do not include leftover student financial aid that you have in these accounts. Investments include stocks, savings bonds, mutual funds, CD's, money market accounts, UGMA and UTMA accounts, rental property (including a rental unit within a family home if it has its own entrance and kitchen and is rented to someone other than a family member), a second residence, commodities, trust funds, stock options, securities, qualified education benefits, qualified education savings accounts as well as installment and land sale contracts. DO NOT include your primary home, any retirement accounts (IRA, 401(k), annuities), the cash value of life insurance policies, UGMA and UTMA accounts where you are the custodian but not the owner, or amounts reported in Question 90. If any of these accounts are owned by a dependent student (a student who is required to report parental information), the value of each of these accounts is reported as a parental asset in this question. If any of these accounts are owned in a parent's name, these will be reported on the FAFSA in this question. This may include college savings plans with other children as beneficiaries. If someone other than you is the owner of the College Savings Plan then this amount may not be listed on the FAFSA. If any of these accounts are owned by an independent student (a student who is not required to report parental information) or the student's spouse, the value of the account is reported as a student asset in Question 42. The value of an investment will be listed as of the day you are completing the FAFSA application. You will list the current market value of the investment on that date. For example, if you own a savings bond with a face value of $1,000 that was purchased last year you will want to determine its actual worth as of today's date. You may use this link to determine a current value http://www.treasurydirect.gov/BC/SBCPrice. Net worth should be reported. If an investment is specifically held as collateral for a debt, this debt may be subtracted from the value of the investment. For example, if you own a rental home worth $60,000 but you owe $30,000 against it you will report $30,000 as the net worth of that property. If the net worth is negative, enter $0. For purposes of the FAFSA, a business is an entity other than a farm. You will exclude the value of a small business where your family owns and controls over 50% interest and has fewer than 100 full time or full time equivalent employees. Your family can include yourself, your spouse, your parents or stepparents, siblings, or other family members directly related to you (i.e. cousins) or related by marriage (i.e. brothers or sisters in law). If your business does not meet this definition, the business value will include the value of all assets tied to your business - land, buildings, inventory, equipment, "blue sky" value, etc. Your value should consist of what these items would be worth if you were to sell them and should reflect what you would ask for your business if you decided today that you would liquidate your business. You will subtract any debt that is held specifically against the business which would reduce the amount you received upon the sale of the business. The net worth of the business is what you would end up with after you sold all business assets and subtracted any debt still owed against the business. In other words, the net worth is your equity stake in your business. If you live on your farm, own your farm and actively participate in its operation you will list a $0 for the net worth of your investment farm (this includes the value of land, equipment, livestock, grains in storage, and outbuildings). Your assets will not be counted nor will your debt. If you rent farm ground out to someone else to farm for you this WILL be considered an investment farm. If you receive pasture rent from another individual, you will need to determine the net worth of the pasture land as an asset. Also if you are a shareholder or own a partnership interest in a family farm that you do not actively participate in farming this WILL be considered an investment farm. In this case you will determine the value of land, buildings, inventory, machinery, livestock, grains in storage, etc that you would sell if you decided to sell your interest in the farm. You may also subtract debt against these items. You will only report your percentage ownership in the farming entity. For example, if you own 100 shares in a corporation then you will count only the net worth of your 100 shares. If your partnership interest is 30% you will count only 30% of the total net worth of the farm partnership. This may be a confusing question so you are welcome to contact your college financial aid office for further guidance.